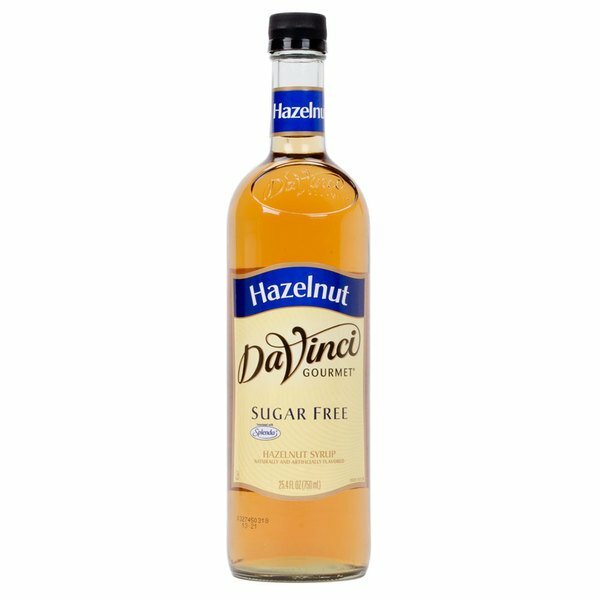 This user-friendly bottle of DaVinci Gourmet sugar free hazelnut flavoring syrup allows your busy baristas to quickly and easily serve up delicious hot, cold, or blended drinks with irresistible flavor without the sugar content! DaVinci Gourmet flavoring syrups complement your beverages without overpowering them or being too sweet. They are specially formulated to resist curdling in milk and hold up well under heat, making them the perfect choice for espresso-based drinks, brewed coffee or tea, and more. 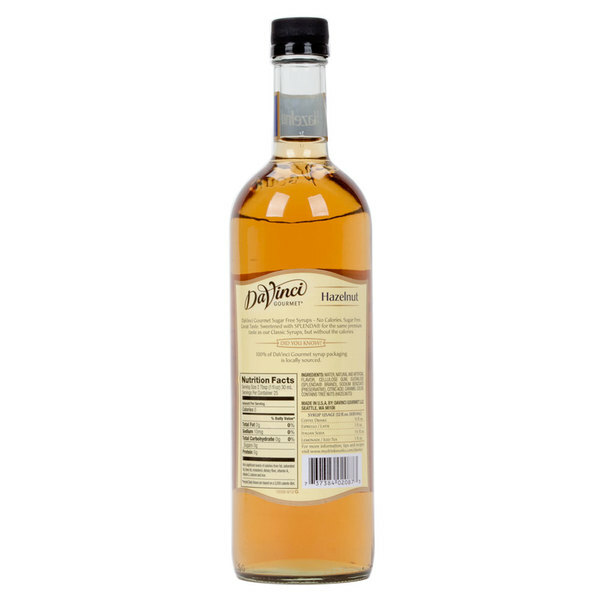 Bring toasted, nutty flavor to your menu with this flavoring syrup. It offers the taste of freshly roasted hazelnut to enhance the fine components of your signature coffee and espresso-based drinks. And, it isn't just for hot beverages; drizzle it on cheesecake or bake it into pastries for irresistible results! Sweetened with sugar free, no-calorie Splenda Brand Sweetener, this sugar free blend is sure to be a treat for your health-conscious patrons! Splenda tastes like sugar, giving you great flavor without the calories. Sold in gourmet coffee shops, specialty food stores, food service outlets, and grocery stores, DaVinci Gourmet products, like this sugar free hazelnut flavoring syrup, have a long history of commitment to quality and superior taste. Tasted a lot better than I expected it to. I just got done ordering another 3 bottle of this because everyone here really seems to enjoy it. The sugar free coffee flavoring syrup is wonderful and has a top notch hazelnut flavor to it. A great syrup to use in my coffee. A great brand of coffee flavoring syrups. The hazelnut is just lacking a little bit of the pungency that makes the flavor so popular. My guests still liked it just need to add a bit more hazelnut punch to make it a five star product. Can't tell it's sugar free! Great flavor and addition to our drink menu. We use this flavor in many recipes for our drink menu. Popular with many customers and our staff. It does have a hazelnut flavor to it. Many liked this one in coffees and hot cocoas. It was best enjoyed hot. I dislike splenda. Just like the original but zero calories! Honestly the flavor difference is very mild and it's a really popular one in our shop, we recommend it! This is my husbands favorite. He uses this to flavor the whole pot of coffee. He pours about 2 tablespoons right into the filter with the coffee in it before brewing. It gives it an excellent hazelnut flavor without sweetening it. I highly recommend this brand above the others. We like to combine this hazelnut davinci with chocolate. It is like Nutella but without the fat and sugar. A good product with superb flavour. This flavor is an excellent substitute for the full sugar version. Feel free to use it in coffee, tea, hot cocoa, ice cream, pancakes, cookies and bread.